With a weakened immune system, you are at risk for illnesses from eating foods that may have traces of bacteria or germs on their surfaces. 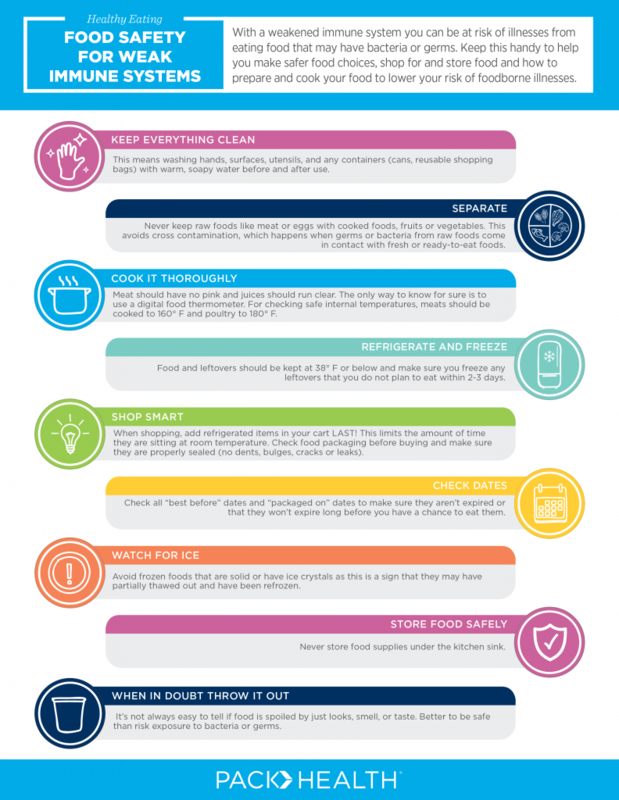 Here are some tips to help you make safer food choices, shop for, and store food and how to prepare and cook your food to lower your risk of foodborne illnesses. This means washing your hands, surfaces, utensils, and any containers (cans, reusable shopping bags) with warm, soapy water before and after use. Never keep raw foods like meat or eggs with cooked foods, fruits, or vegetables. This avoids cross-contamination, which happens when germs or bacteria from raw foods come in contact with fresh or ready-to-eat foods. Meat should have no pink in the center, and juices should run clear. The only way to know for sure is to use a digital food thermometer. For checking safe internal temperatures, meats should be cooked to 160℉ and poultry to 180℉. Food and leftovers should be kept at 38℉ or below and make sure you freeze any leftovers that you do not plan to eat within 2-3 days. Freezer-friendly baggies (like these from Walmart) are our favorites for leftovers! When shopping, add refrigerated items to your cart LAST! This limits the amount of time they are sitting at room temperature. Check food packaging before buying to make sure they are properly sealed (no dents, bulges, cracks, or leaks). Click here to download your own helpful guide!